Diablo is an easy growing shrub that is very hardy (zone 3-7) and adaptable to a wide range of conditions. It is tolerant of many soils, preferring a well drained site. It will take some shade but will have the best color in full sun. Reaching 5-6' high and 4-5' wide, this will do great in back of the perennial garden or mixed in shrub borders, or even as a foundation plant. The flowers and foliage are great for cutting. 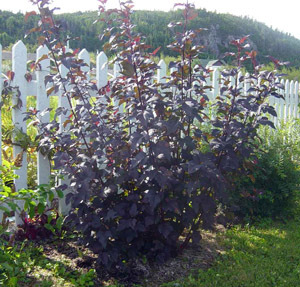 This can be a great replacement for Purple sand cherry in landscapes.